OK. So let me get something straight. 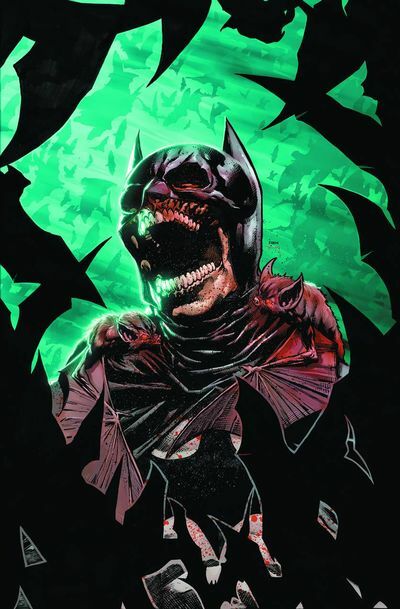 Batman has a Bat-mobile, a Bat-cave, plus a plethora of Bat-related Bat-gadgets -- but -- for some unexplained reason, he has never-ever read this great Bat-story Published by DC Comics, in December, 2013, created by John Layman, Aaron Lopresti, and Jason Fabok? I wonder why though? Is it too Batty for him? Using GENERAL terms, answer the following 4 questions about this STORY entitled 'Crown of Fear'. WHAT'S THE MAIN THRUST OF THIS TALE: 'Oi! Snap out of it, Langstrom!' says Batman to the recently deranged Man-Bat. 'I want you to listen. And I want you to focus real good too' he then continues, 'That way you can help me figure out why a hoard of ravenous bat's are eating the residence of Gotham City'. ARE THE MAIN OBJECTIVES ACHIEVED: Yeah. Pretty much. More or less. Despite Kirk and company being covered from head to toe in a ton of Bat sh*t! ANYTHING ELSE HAPPEN: Well, let's just say that a duplicitous wife becomes slightly too batty for her own liking. HOW DOES THIS STORY END: With the discovery that a certain caped crusader has unveiled his true identity to a certain feline cat-burglar. Hey! DC! What are you playing at, eh? Are you saying we should take a villain seriously, even when she calls herself 'The Bat Queen'? Nah! Not on your Nelly, buck-o! If truth be told I found this one-dimensional-name very false on my tongue, because it didn't have that pizzazz other villainous name's commonly possess. (+) Ever since I first saw Aaron Lopresti's great artwork on the now defunct 'Batman & the Outsiders' title, I can safely say he has never disappointed me with his grand and expansive visuals. I mean, just take a look at what he's done on this fantastic issue! Not only were his splash pages very dynamic in both frame and composition, but his character work showed great character too, especially in the very expressive emotions omitted from their faces. (+) Another aspect about this adventure I adored would be how it managed to tell a stand-alone story in a rather evolving and novelistic manner. From my own point of view, a story should be allowed to progress in stages, and not dumped on a page as if to buck a trend. THUNK! Know what I mean? (+) Word to the wise. If Batman ever tells you he's injected you with a serum to repress your baser urges, please take note of how that 'ploy' turned out nearing the end of this escapade. Yeah! You get my gist now. Don't you, folks? Great, wasn't it? Cause it showed how crafty our ever loving Dark Knight truly is. Hehehehe! (+) Wait a minute! Are my eyes deceiving me? Did the last page of this book unveil that... coff-coff... told... sniffle-sniffle... who... at-cho... really is? Wow! Will wonders never cease! Whatever next? A Bat-Wedding perhaps? Ohhhhhhhh! (-) If like me, you've followed the Man-Bat back-up feature over the last couple of months, I bet you anything you could've foreseen where the main thrust of this tale was initially headed. Not that this was a bad-bad thing of course. Nah. Not at all. In spite of its rather obvious nature, on a conceptual level I more than understood why this plot-point had to be conveyed. 'BAT DANCE' BY PRINCE: Hey! Don't groan, folks! Tell me you can do better. Tell me you can name another bat related song you compare to this story which has a funky style and a rhythmic confrontation between the species? Heck! It's Bat-tastic!!!!! 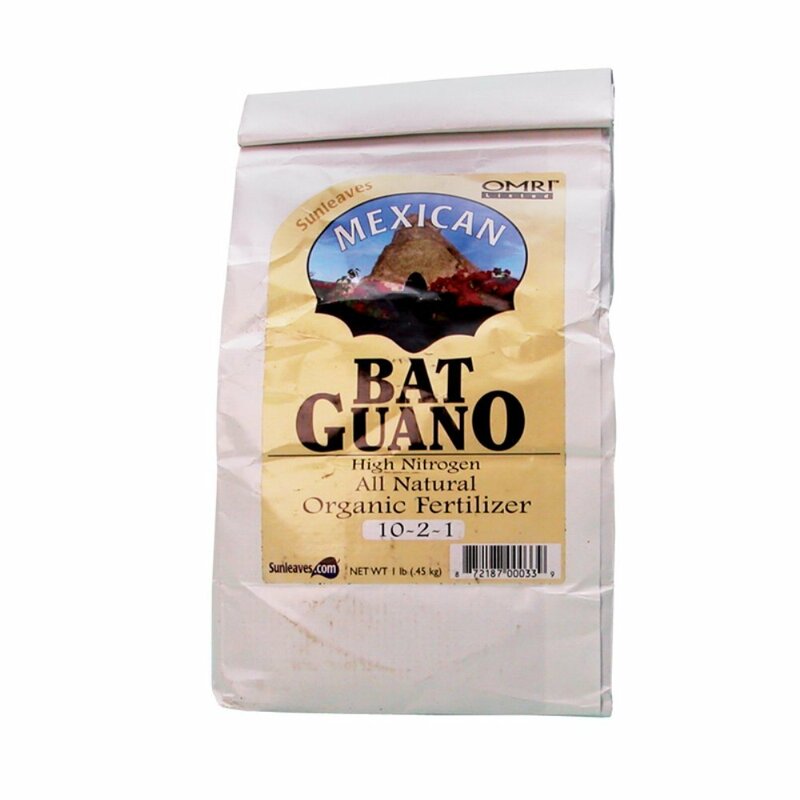 BAT GUANO: Hey! Hold your horses, pal! I'm not trying to say this tale was sh*t! Far from it. What I'm trying to do instead, dear reader, is insinuate that there were a lot of bat's in this adventure, and each of them were 'in the sh*t' one way or another. Now my earliest encounter with the 'Kirk Langstom Man-Bat' was in the pages of the seventies 'Batman Family Giant' ongoing series. If I remember rightly, it was during my days scouring the back-issue bins at my local comic shop, hoping to find some rare oddity that no one else could. And I did you know. I did find something special and rare. 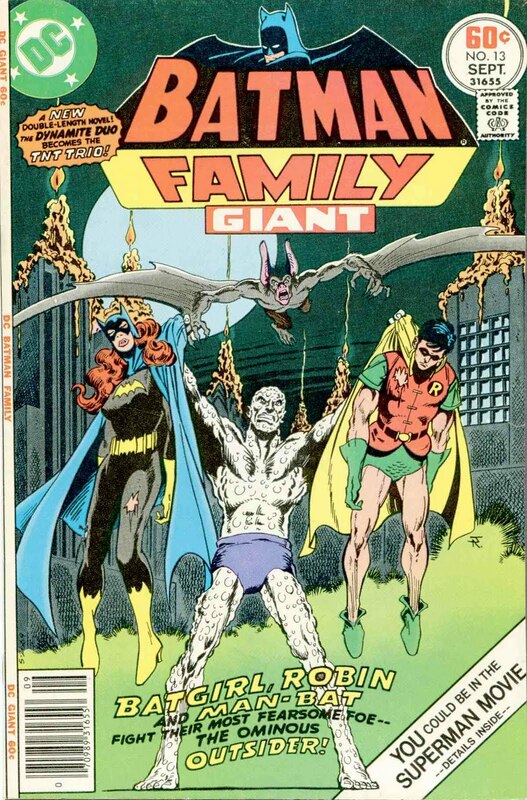 There it was, with the cover drawn by the one and only Jim Aparo, depicting a picture of Robin and Batgirl being held up by the Outsider, whilst Man-Bat loomed very close behind him. 'Wow! I've got to see what that's all about' I said to myself at the time. 'This looks great'. And -- again -- it was great. It was so great in fact; I couldn't help by feel sorry for Kirk when I then saw his not so illustrious comic book career abruptly dip and parry over the preceding years. Well! Let's face it! He's been an anti-hero. He's been a reluctant ally. He's been a villain. And he's been a family man too. Having said that, though, what is he really? Truly? Is he all of these things rolled up into one? Or is he a modern day version of Doctor Jekyll and Mister Hyde for the comic book age? Personally speaking, I'd say Man-Bat works best when both sides of his character are put on display. This way, 'us bat-fans' can see the transformation from the familiar to the obtuse, thus giving us something to associate with by default. Heck. Why else do you think I loved reading this issue of 'Detective Comics' so much? As it did just that -- transform the familiar to the obtuse -- plus it also gave me some hope that one day soon Kirk will be back on a regular book once more.